There’s a reason they call it the Great American Speedway. Fastest mile and a half NASCAR track. 24-degree banks on the turns. 1500 acres for you and 190,000 of your closest friends. Four Cowboy Stadiums fit inside the infield. Home of Big Hoss TV – the world’s biggest high-def video board. 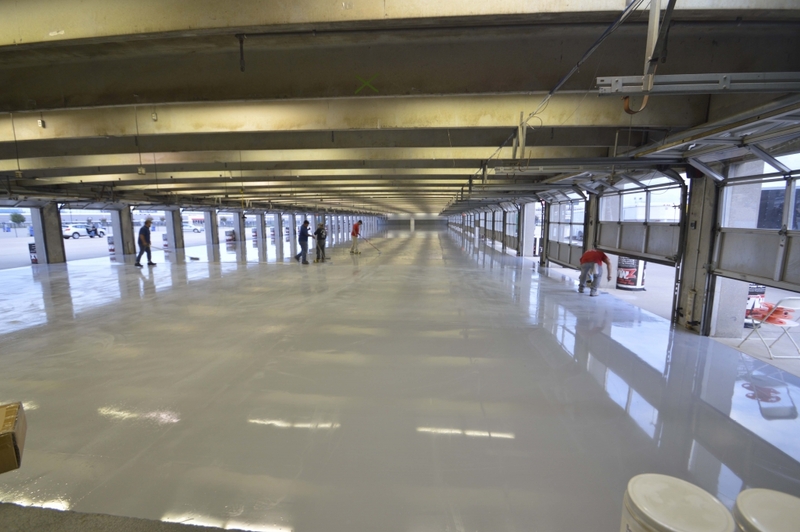 And just in time for NASCAR’s Triple-A Texas 500 Tripleheader Weekend, Texas Motor Speedway partnered with Austin-based Inter Tech Flooring, Laticrete Supercap and SPARTACOTE concrete coatings to bring a whole new, high-performance floor to the garage areas and technical inspection bays. 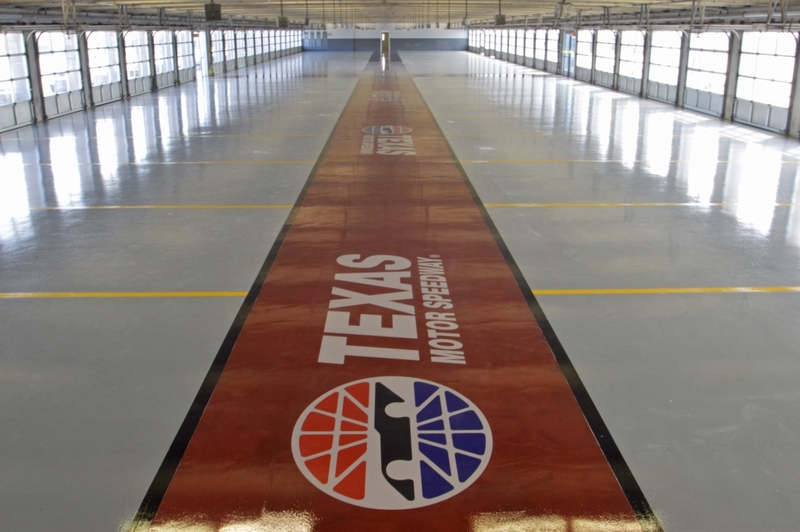 Inter Tech Flooring’s crew applied SPARTACOTE Resinous Coatings and moisture mitigation to give Texas Speedway participants over 22,000 square feet of Texas pride right inside the commercial garage bays. It’s the commercial bay garage first floor of its kind at any NASCAR track. Beautiful. Tough. Durable. Professional-grade. Ready for action. They’ve got a saying out there – No Limits. And with LATICRETE and SPARTACOTE, there’s no limit to flooring design possibilities, nor to what you can accomplish. With over 40 high-performance cars being worked on, this vast, NASCAR garage will be chock-full of power tools, floor jacks, hot tires and hotter torches that leave abrasive dirt and debris everywhere. Add to that – grinders, solvents, engine fluids and cleaners, and your concrete floor better be ready for some serious punishment. 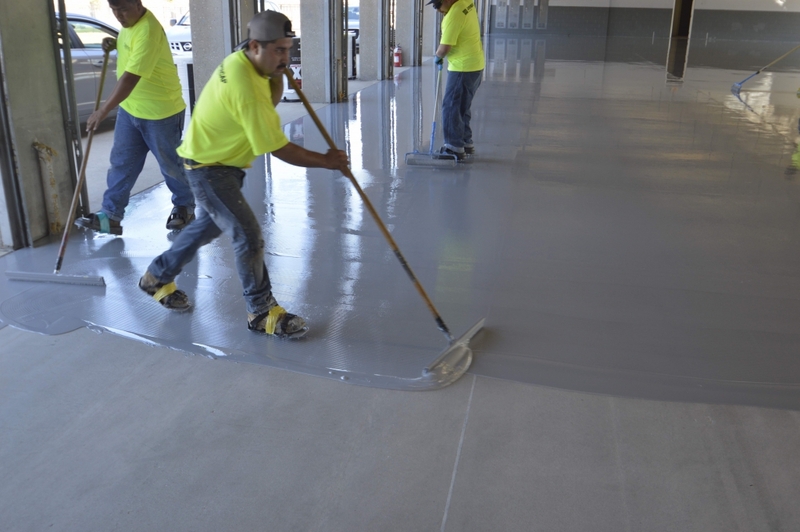 SPARTACOTE concrete coatings offer commercial-grade garage areas customizable colors and textures, excellent protection against abrasion and chemicals, and fast return to service. 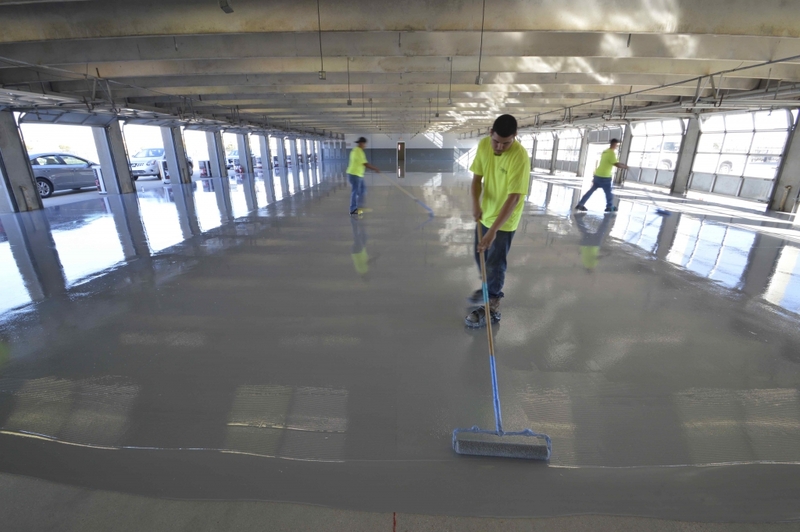 This concrete coating system is up to the NASCAR challenge. No Limits. 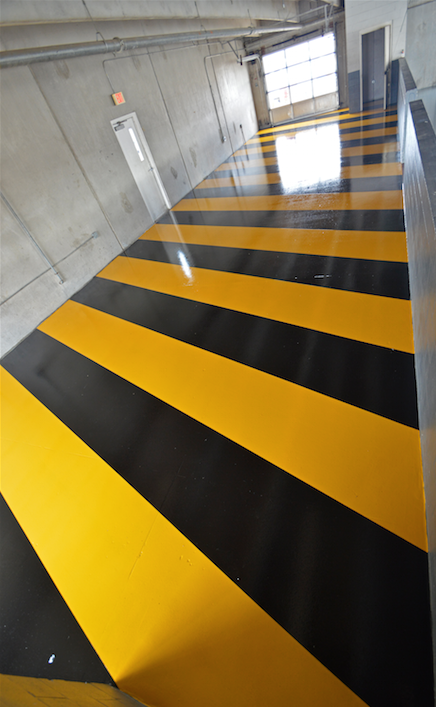 SPARTACOTE coatings also offer flexibility in line striping for safety areas. Designers required black and yellow zebra stripes for the NASCAR inspection bays, deep cherry red SPARTACOTE metallic coatings in the walkways, and over 90 feet of Texas-size Speedway logos embedded in those cherry-red spaces. This floor design needs exacting measurements and precision equipment to make sure every line and stripe ends up straight and even. On the walkways, a base coat of SPARTACOTE black goes down first over the concrete to guarantee an extra-rich, deep cherry metallic top coat. The stripe design in the NASCAR inspection bay starts with the same solid black Spartacote base coat. A rich yellow mid-coat covers the black base. The end result captivates—right through the door and into the hall. 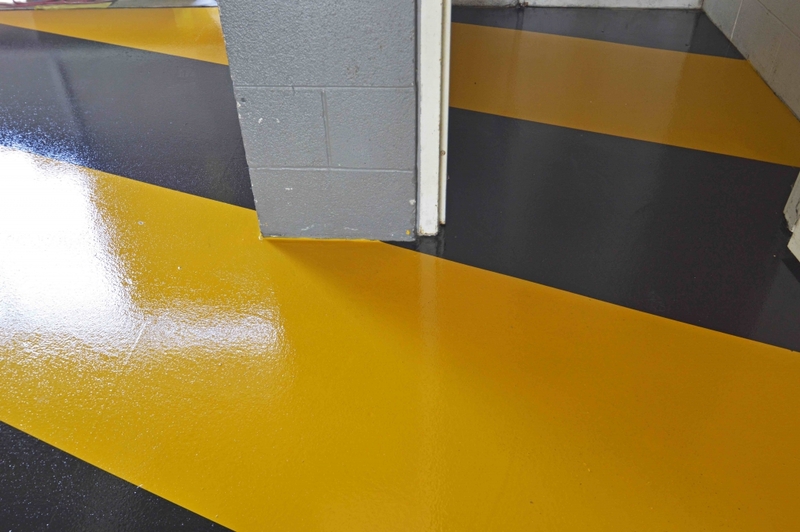 And to lock-in every stripe, sparkle and letter in place, the SPARTACOTE resinous flooring system is finished with a clear top coat, giving it a spectacular, rock-hard, slip-resistant finish that’s ready for anything the world’s top race car drivers and mechanics can throw at it.